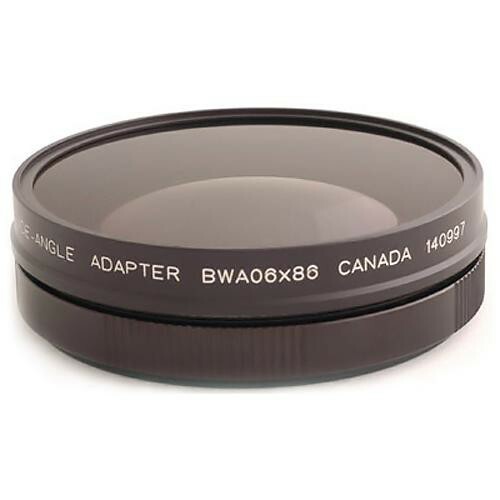 This Cavision BWA06X86B-EX1 0.6x Wide Angle Adapter Lens is a broadcast class adapter lens compatible with the Sony PMW-EX1, EX3, PMW-200, and Z7, or the PMW S270 and PMW-300 with the standard Fujinon lens attached. The wide-angle coefficient is 0.6x, which delivers a 40% wider angle than the user's master lens. Clamps onto EX1 bayonet mount for fast and secure attachment. Can also be used on Sony Z7/S270 standard lens. Provides a 40% wider angle of view. With optional pressure ring (not included) can also be used on ENG lenses with 85 or 86mm O.D. Box Dimensions (LxWxH) 5.4 x 5.4 x 3.8"